This blanket features a durable waterproof exterior as the 600 denier weave contains ripstop technology to ensure longevity. Easy-to-use, adjustable front closures contain snaps to make application and removal a breeze as the double surcingles keep the blanket securely in place. 200 grams of polyfill offers insulation against cold weather as the smooth nylon interior polishes the coat for a beautiful shine all winter long. 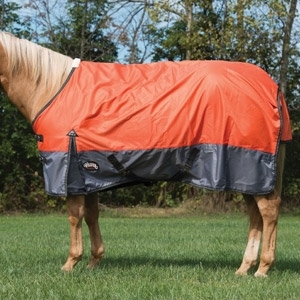 Finished with fleece at the withers for comfort and wide gussets at the shoulder to prevent rubbing, this turnout blanket is certain to be a necessity for the cold, rainy months. Reflective accents for added visibility.